Building on the legacy of the Sloan Digital Sky Survey (SDSS) and SDSS-II, the SDSS-III Collaboration is working to map the Milky Way, search for extrasolar planets, and solve the mystery of dark energy. SDSS-III’s newest release is Data Release 9 (DR9). DR9 contains the first spectra of the Baryon Oscillation Spectroscopic Survey (BOSS), and improved stellar parameters from SEGUE-2. All of DR9’s images, spectra, and measurements are available to anyone online. You can browse through sky images, look up data for individual objects, or search for objects anywhere using any criteria. 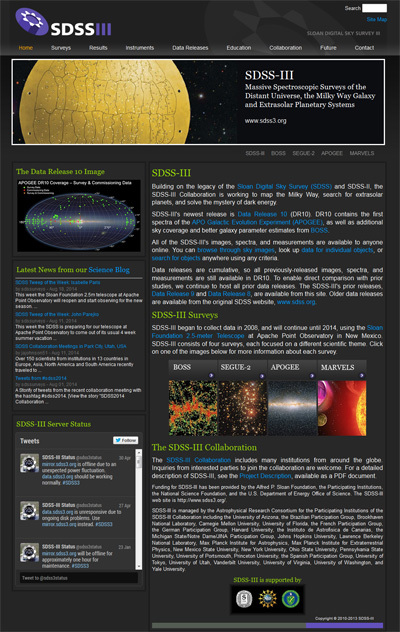 SDSS-III’s first release, Data Release 8 (DR8), is still available. DR8 contains all the images ever taken by the Sloan Foundation 2.5-m Telescope. Together, these images make up the largest color image of the sky ever made. A version of the DR8 image is shown to the right. DR8 also includes measurements for nearly 500 million stars, galaxies, and quasars, and spectra for nearly two million. Fingerprint Digital Media role: Site design, Logo design and site build.